Although the term “omniphobic” may sound like a way to define someone who is frightened of everything, it in fact refers to a unique type of surface that repels almost all kinds of liquids. Such kinds of surfaces can perhaps be utilized in everything from coverings that guard against damaging chemicals and resist stains, to ship hulls that boost efficiency and reduce drag. 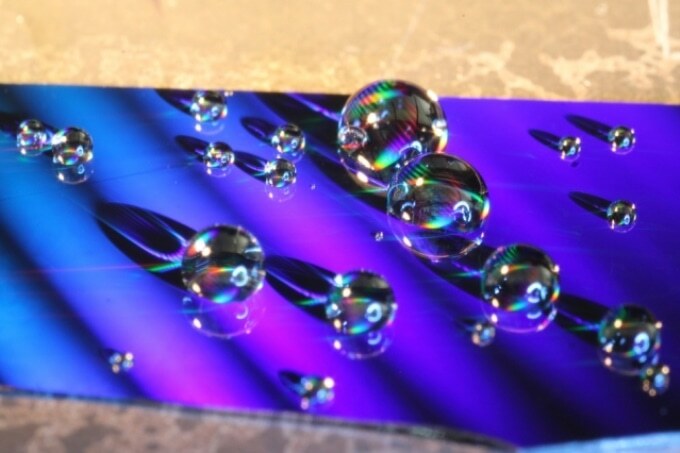 However, to date, the omniphobic surfaces developed always experience a significant problem: their liquid-shedding properties are rapidly disabled by condensation. Now, MIT researchers have identified a new method to resolve this effect by creating a surface design that radically lowers the effects of condensation, albeit at a slight compromise in performance. Professor of mechanical engineering and department head Evelyn Wang, Graduate student Kyle Wilke, and two others reported the latest findings in the journal ACS Nano. Producing a surface that can shed almost all liquids needs an accurate kind of texture that generates a range of microscopic air pockets isolated by ridges or pillars. These tiny air pockets ensure that most of the liquid does not come into direct contact with the surface, and thus prevent it from “wetting” or spreading out to enclose an entire surface. Rather, the liquid beads up into tiny droplets. “Many liquids are perfectly wetting, meaning the liquid completely spreads out,” states Wilke. These include most of the refrigerants that are used in refrigerators and air conditioners, many alcohols, and hydrocarbons like those used as lubricants and fuels. “Those are very difficult to repel. The only way to do it is through very specific surface geometry, which is not that easy to make,” he adds. If damage is caused to such surfaces—for instance, if one of the microscopic pillars is broken or bent—it can defeat the entire process. “One local defect can destroy the entire surface’s ability to repel liquids,” he states. And condensation, such as dew forming owing to a temperature variation between the surface and the air, behaves in the same way, damaging the omniphobicity. “We considered: How can we lose some of the repellency but make the surface robust” against both dew and damage, says Wilke. “We wanted a structure that one defect wouldn’t destroy.” Following extensive experimentation and calculation, a geometry was identified that fulfills that objective and this was partly due to the tiny air pockets disconnected from instead of being connected on the surfaces, thus making it much less likely to spread between the pockets. Wilke explained that the features have to be extremely small because during their formation, the droplets are originally at the scale of billionths of a meter, or nanometers, and between these increasing droplets, the spacing can be below one micrometer. The main architecture devised by the researchers is based on ridges whose profiles look like the alphabet T, or in certain cases the alphabet T with serifs (the very small hooks at the ends of letter strokes in certain typefaces). The shape itself as well as the spacing of these ridges is key to attaining the surface’s resistance to condensation and damage. The shapes are developed such that they use the liquid’s surface tension to prevent it from entering the minute surface pockets of air, and the ridges connect in such a way that any local penetration of the surface cavities are prevented from spreading to others nearby—as the researchers have proved in lab tests. With the help of traditional microchip manufacturing systems, the ridges are designed in a multistep process. First, the spaces between ridges are etched away, then the edges of the pillars are coated, and finally, those coatings are etched away to produce the indentation in the sides of the ridges, leaving an overhang looking like a mushroom at the top. Wilke added that due to the restrictions of the present technology, omniphobic surfaces are seldom used at present; however, enhancing their resistance and durability to condensation could pave the way for novel applications. However, the system will need to be further refined beyond this initial proof of the concept. It can possibly be used for making self-cleaning surfaces, for improving resistance to ice accumulation, for enhancing the efficiency of heat transfer in industrial processes such as power generation, and for reducing drag on surfaces like the ships’ hulls. According to the researchers, such types of surfaces can potentially offer protection against corrosion, by minimizing the contact between the surface of the material and any corrosive liquids that it may be subjected to. And since the novel technique provides a means to accurately design the surface architecture, it can be applied for “tailoring how a surface interacts with liquids, such as for tailoring the heat transfer for thermal management in high-performance devices.” Wilke says. The researchers also included former graduate students Zhengmao Lu and Daniel Preston. The study was funded by the cooperative agreement between MIT and the Masdar Institute of Science and Technology in Abu Dhabi (now Khalifa University), the Abu Dhabi National Oil Company, the Office of Naval Research, the Air Force Office of Scientific Research, and the National Science Foundation.